Small batch vegetarian stuffing with mushrooms is the perfect simple stuffing recipe to make for a small Thanksgiving gathering. As much as we typically think of Thanksgiving as a huge gathering of all of our loved ones, there are some years when your Thanksgiving gathering may be paired down. 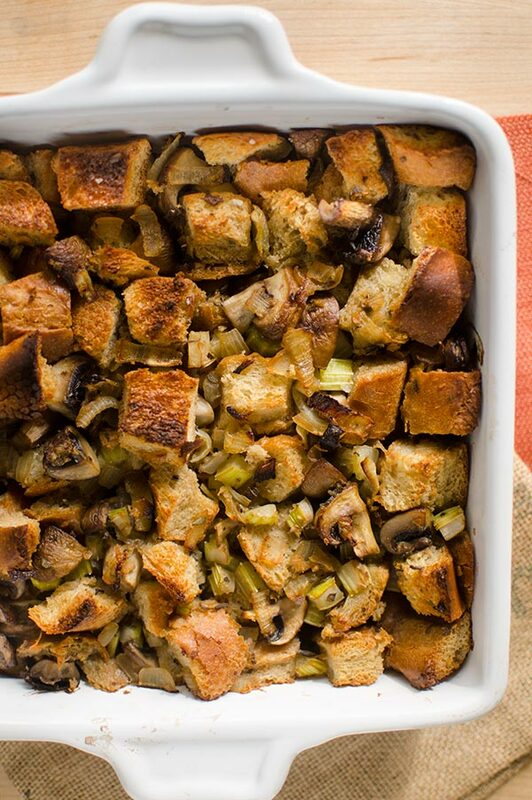 Maybe you’re just having a few friends over the celebrate the holiday and don’t want to make a big batch of my sourdough Thanksgiving stuffing? Lucky for you, I created this small batch stuffing recipe. What makes this small batch? It cooks in an 8×8 square baking pan, which means the amount of stuffing is far less from most traditional stuffing recipes. Which means it’s the perfect stuffing recipe if you’re young, on a budget and hosting your own small Thanksgiving get together. Maybe you’re even hosting your first Thanksgiving? 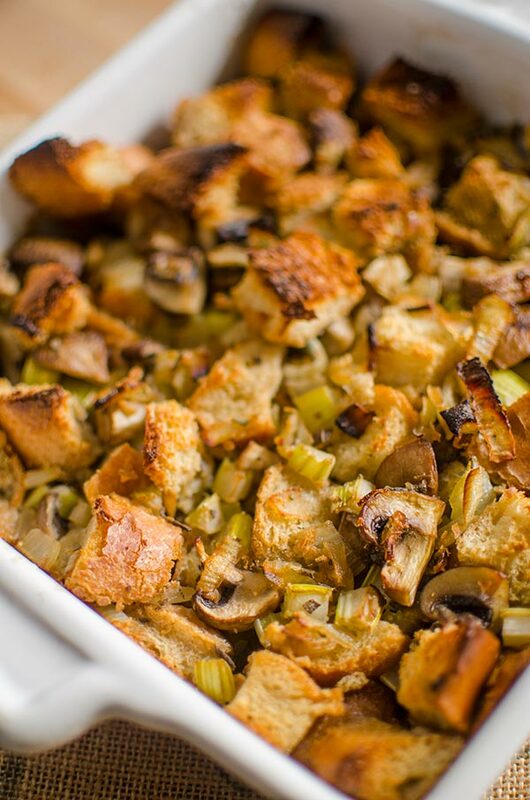 The idea of someone cooking my stuffing recipe for their first Thanksgiving makes me so happy! This recipe has a smaller list of ingredients than my other stuffing recipe, but it still packs a ton of flavour. It comes down to the mushrooms that provide some “meatiness”, and the fresh sage. When it comes to herbs in stuffing, you could use a combination of different kinds of fresh herbs (rosemary, thyme, sage etc. ), but you absolutely can’t miss the fresh sage. Even if you have to go to three or four grocery stores, it is worth it. I prefer using fresh herbs over dried herbs here as dry herbs tend to have a different, more bitter flavour. This recipe takes under an hour and the stuffing can definitely be made the day before Thanksgiving–just heat it up in the oven when the turkey is resting, and cover it with aluminum foil to avoid the bread browning too much. Set a large frying pan over medium-low heat, add butter, celery, onion and mushrooms, season with salt. Cook for 6-8 minutes or until softened. Combine bread with celery mixture and sage in a large bowl. Add 1 cup of broth and stir to combine. Dump into a 8x8" baking dish, Bake in the centre of the oven for 30, check during last 10 minutes and cover with foil if beginning to brown too much. Let me know if you give this small batch vegetarian stuffing a try in the comments below.